A work train came through Emsingen station on the main track this afternoon. Imagine the characteristic rumble of the V36 / BR 236 Diesel locomotives running in a pair for enough traction over "the hill". 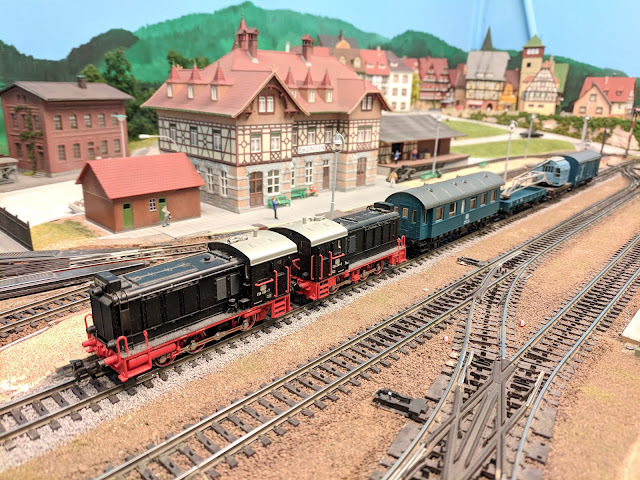 The locomotives are Maerklin 3346, a limited run edition known as "Doppeltes Lottchen". I have not yet converted them to digital operation. They look really nice with this train. The cars are from the Lima L149925-4 package and still have their DC wheel sets. The crane is the more-than-old Maerklin 315/2. I need to build a boom support for the crane and mount it on the flat car, along with some boxes, wires, and other supplies. The materials car should probably go between the flat car and the workers car. Then I could use a Rungen flat car loaded with ties, rails, and more materials needed for on demand track maintenance. Nevertheless this train is capturing the look I've been after quite nicely.